Pencil cases at the ready. The comedy scene wakes up from the sleepy summer hols and gets back to it. Well, we know that the Manchester scene never grinds entirely to a halt, but there is more to be seen in September. To be honest, you probably don’t need to bring a pencil case. Though you can never go far wrong with a spare protractor. Shearsmith, Pemberton, Gatiss and Dyson reunite to resurrect the wondrously peculiar inhabitants of Royston Vasey. 6th birthday bash for a favourite gig for the comedy connoisseur. Four incredible acts line up, and knowing this gig they will be something special. Heading into autumn, with a full diary as ever, are the two dedicated clubs in Manchester, The Frog and Bucket and The Comedy Store. The Frog has pro acts every Thursday through to Saturday and the newbie gong night Beat the Frog on a Monday. But joining that line up this month, Sunday 9 sees a return visit from Aussie John Robertson and his interactive game show The Dark Room. 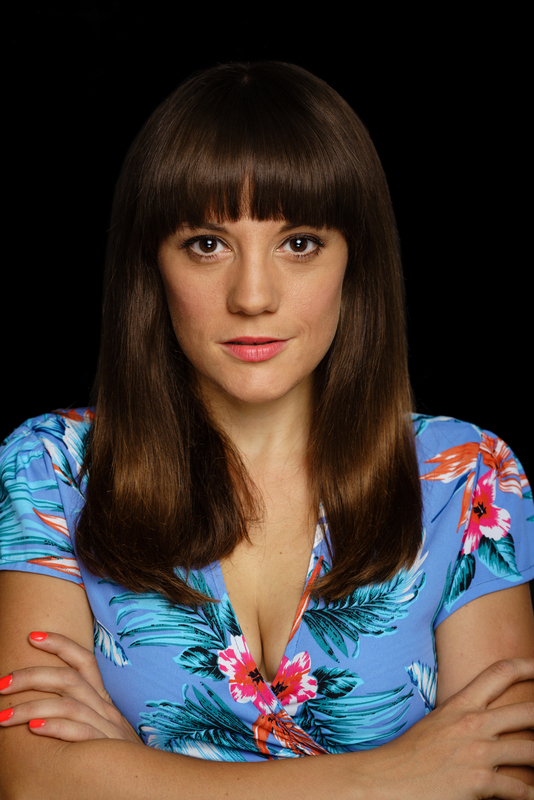 Canadian comedian and disability campaigner Tanyalee Davis brings her show Actual Size to the club on Sun 23 and there’s a return visit from ITV’s The Chase’s Paul Sinha with Shout Out to My Ex. Plus there’s a hypnotist show courtesy of David Bolton on Wed 26. Over at The Comedy Store, aside from their pro shows Thursday through to Saturday on Sunday 2 they play host to the Laughter Yoga Championships (3.30pm), yep it’s a real thing and very therapeutic! Sunday 9 and 23 see professional comedians trying out New Stuff under the watchful gaze of compere Toby Hadoke. Alex Boardman showcases his New Comedians on Sun 16 plus there’s the Comedy Store for Kids on the afternoon of Sat 15. Then rounding off the month is Aurie Styla with ComedyMania on Sun 30. The Didsbury Comedy Club, Didsbury Cricket Club, £8; The Heatons Comedy Evening, The Heatons Sports Club, £8.50; Sun 2 Sept.
Adam Rowe and Tom Houghton double up while Kate McCabe provides the support and Toby Hadoke is compere in Didsbury, and Louise Young is the middle spot at the Heatons and MC is Justin Moorhouse. The new term begins with a great line up all around as ever. Headliners are sharp US stand up Spring Day on Tues 4, pulling no punches Scot – Fern Brady on Tues 11 and novelist and stand up Nick Revell on Tues 18. 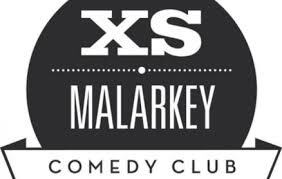 The month rounds off with Malarkey celebrating its 21st birthday on Tues 25 with 3 headline acts and given how well loved this gig is by the comedy scene you know they’ll be big acts. Barking Tales, Zombie Shack, Wed 5 Sept, Free but with donation bucket at the end. The monthly comedy night where the acts get to talk about mental health. With Scott Bennett, Katherine Mather and Lindsey Santoro plus compere and creator Harriet Dyer. The magnificent pedant brings his latest findings and exasperations in With Great PowerPoint Comes Great ResponsibilityPoint. He also once lived in a house full of Daves when he was at Uni in Manchester. True fact. One of the most joyous performers around, the Stockport mother of five and lover of leopard print works her magic in the lovely fancy tent in Ordsall Park. This month with frenzied livewire Phil Nichol, Wendy Wason, Jamie Hutchinson and MC Justin Moorhouse. Celebrating the second series of Mid Morning Matters, the four Alan Partridge enthusiasts bring their unofficial podcast to The Lowry. Another comedy birthday as Trapdoor reaches 4! The birthday celebrations are bound to be fine ones at this quality gig so get your tickets now, you won’t be disappointed. pro night Laughing Cows on Sat 30. Line up to be confirmed. In these days of bigotry and a lack of empathy, Burton advocates kindness for a better world, to combat mental health problems and even defeat death! Jay Foreman with a cheeky hour of song, poetry and comedy for children of all ages and their folks. One of the finest stand ups currently working with his latest show of inspired poetic ramblings and oddball thoughts in Dr Cosmos. Early Doors, The Lowry, Sun 17 – Sat 22 Sept, currently sold out. Craig Cash and Phil Mealey’s adaptation of their sweetly melancholic sit-com with a brand new story for the original characters. The boy from Luton who really likes a crouton performing two shows. One for families in the afternoon and his more rock n roll naughty poetry set in the evening. Legend. Star of BBC’s The Mash Report, the multi-talented Parris regales with song, sketch and satire in It’s Fun To Pretend. 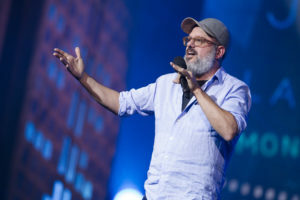 The star of Arrested Development and Mr Show, a cult coup for Perfect Strangers Comedy bringing him to Manchester with his latest solo show Oh Come On. Comedic pianist Stone on tour once more with a mixture of old favourites and new, stand up and song. She might update you on the Philip Schofield obsession. The comedian and actor superstar of the Rush Hour films and many others gets back up on the stage. The funny magic man from Middlesborough with a brand new show Marvels, expect works of great wonder coupled with a cheeky sense of humour.